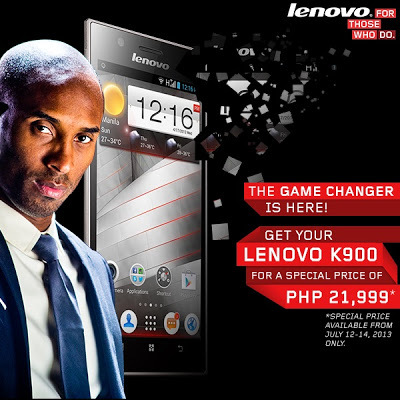 Time to add some International brand in our collection of smartphones, this time Lenovo K900. Endorsed by the basketball star Kobe Bryant and dubbed as "The Game Changer". So what's make this phone the game changer in smartphone industry? More than being an Android smartphone, K900 is ultimately powered by an Intel Processor, specifically a 2.0GHz dual-core Intel Atom Z2580 Clover Trail+ Processor which is mostly found in Netbook computers. We all heard about Corning Gorilla Glass in smartphone market, but not a 401ppi Corning Gorilla Glass 2 and we all know 2 is better than 1 ^_^. Not to mention its RAM which is 2GB RAM that can hold much task and apps at the same time, and although Lenovo K900 has no microSD slot it has some glorious 16GB internal memory, and I do hope that's enough memory for your all around need for Lenovo K900. Promo price will be Php21,999 and available in the stores provided below. I hope you will have one of the stores near you, and be sure to share your experience about Lenovo K900 when you have it.